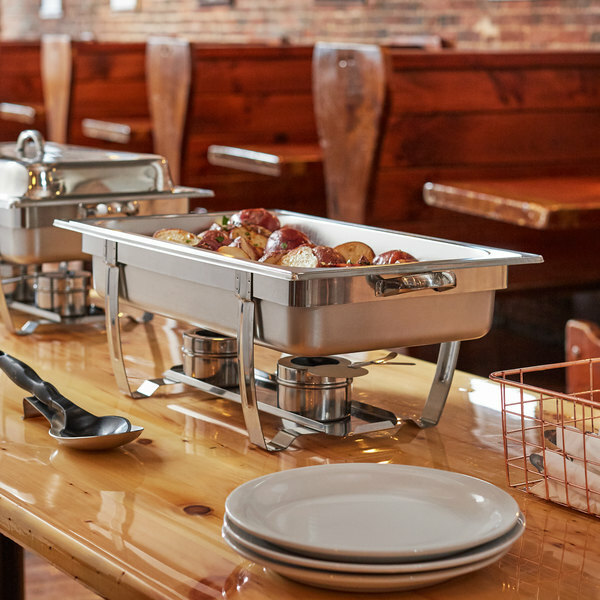 From parties to office events and cruises, this Choice full size chafer will exceed your serving needs. 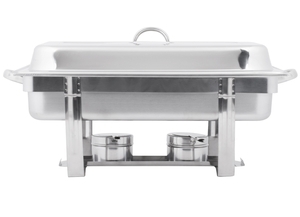 This Choice chafer set includes all of the necessary parts to assemble a full size 8 qt. 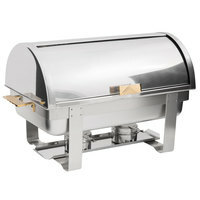 chafer that will keep large amounts of food ready to serve any crowd. 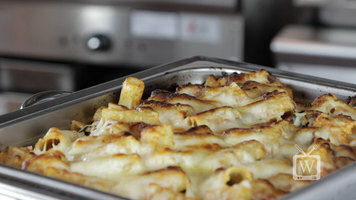 Easy to use and functional, it makes a great addition to your buffet or catered event. For compact storage, several chafer frames can be nested together in between events. "These are awesome. I keep ordering these more and more as my business expands. They are of great quality, polishes very easily, nice elegant chafers at great prices!" 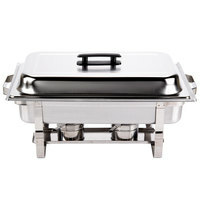 This chafer includes a welded stainless steel frame that is conveniently stackable. Several frames can be nested together for easy, compact storage. The four broad legs ensure optimum stability and protect the chafing fuel. The half-circle handle on the top of the lid allows for easy and safe access to the food. Two side handles on the chafer's frame enables steady transportation. This set features a full size food pan and water pan, both made of easy-to-clean stainless steel. These holders promise patron and staff safety, keeping hands, clothes, and other flammable contents a safe distance from the flame. Position the fuel cans on the elevated fuel shelf, so your entire pan remains heated throughout the event's duration. Can I use different sized food pans in this chafer? For any of our chafers that come with a 2 1/2" deep, full-size stainless steel food pan, you may also purchase two 1/2 size or three 1/3 size pans for added serving flexibility. Whichever size food pans you decide to use, make sure you're using only 2 1/2" deep pans, as they allow the proper amount of space for water and steam. Is this chafer dishwasher safe? 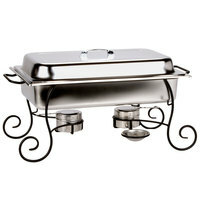 While the food pan, water pan, and cover are dishwasher safe, the chafer stand and fuel holders should be hand washed. Wash with soapy water and a microfiber cloth for best results. 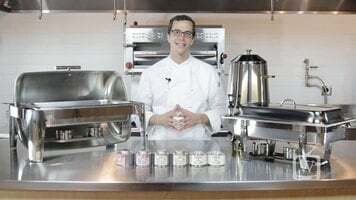 In this video, Corporate Chef Matt Schuler explains the best options to suit your needs when it comes to chafer fuel. From gel fuel or wick fuel, or fuel that burns up to 6 hours, Choice Chafer fuel has just what you need for every occasion! Check out this video to learn some vital tips about handling chafers and chafer fuel! 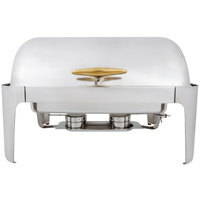 Choice offers an expansive selection of chafing dishes, from economy models to ultra-stylish, high-end options. All dishes are designed for reliable performance and durability, while delivering unbeatable value. Learn more by watching this helpful, overview video. 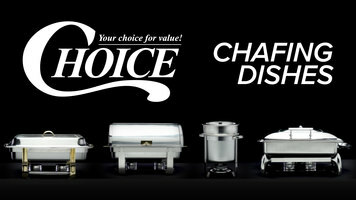 Take a look at what accessories Choice has to offer for chafers! 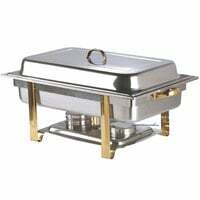 Whether you're catering a banquet, wedding, bridal shower, or other special event, we have the best selection of chafers and accessories at the best prices. My name is Matt Schuler, product expert and corporate chef. Today I am going to show you why Choice brand chafing fuels should be your #1 Choice for chafing fuel. Our buying power and skilled purchasing department allow us to keep our pricing incredibly low without sacrificing quality. We offer 3 different types of chafing fuels by Choice. 2 hour, 4 hour, or 6 hour(show pic of 3 cans) Of these three products, you will need to choose which fuel source best fits your application: wick fuel or gel fuel. 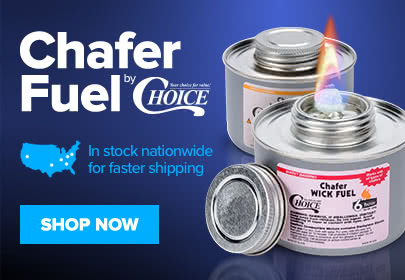 Choice chafer gel fuel is the hottest and longest burning ethanol fuel on the market! Made from 200 proof gelled ethanol and capable of producing 1630 BTU's per hour, its gelled formula provides a higher heat output than conventional wick fuels and allows for maximum burn time. It is also easy to light, odorless, and burns clean. 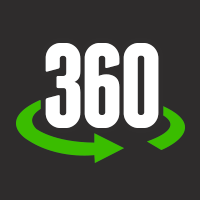 It delivers high-quality heat that burns hotter, longer, and safer than comparable fuels. Choice Gel fuel is offered in a 2 hour burn time. While Choice wick fuel is offered in 4 & 6 hour burn times. Although the 2 hr gel fuel offers to the lowest cost per can, the best value in terms of burn time & cost/hour is the 6 hour wick fuel. Because our wick fuel offers a convenient screw on lid, you can reuse the fuel to get the full 6 hours of usage out of it. If safety, flexibility and cost per hour are what you are looking for, then Choice wick chafer fuel is your brand. Our 6 hour wick fuel costs 18 cents/hour as compared to 24 cents/hour for the 4 hour wick fuel and 26 cents/hour for the two hour gel fuel. Its wick design and diethylene glycol fuel promote safe burning and help to keep the can cool to the touch even during use, while still providing a consistent, long-lasting flame. Even when spilled the liquid does not burn! These Choice fuels are also eco-friendly! Each can is made from recyclable aluminum, and the ethanol is produced using natural and recycled raw materials, resulting in a high-performance chafer fuel that is organic, biodegradable, 100% recyclable and made in the USA. Choice chafer gel and wick fuels are both great product, but here is a comparison to make your decision easier. Offered in a 2 hour burn time, Choice Gel fuels burn the hottest, are the least expensive and are the best option for chafers with low-resting water pans. On the other hand, Choice chafer wick fuels are available in both a 4 and 6 hour burn time, burn clean diethylene glycol, feature a resealable lid to get the maximum burn time and are cool to the touch. In addition, you don’t have to worry about spilled liquid because any spilled wick fuel won’t ignite. Check out our burn time comparison sheet, cost per hour chart, as well as the MSDS sheet, and our chafing fuel buying guide on our product page. (Show screen shot of product page/comparison chart/cost per hour chart). We also have a chafer fuel savings calculator where you can plug in the amount of fuel used per week and see how much savings you will have by switching to 6 hour Choice brand wick fuel. These charts will help you make a better buying decision! As always, click on the chat button for further questions regarding Choice brand chafing fuels. We hope this video helped you make the right “choice” for your foodservice application!! Remember to always follow equipment manufacturer’s recommendations for pre-heating, but here are some safety tips to insure you have a safe and efficient chafer set-up…(Voice over portion showing shots of each step quickly) -Always select fuel to last the length of engagement so it will not be necessary to change fuels during the event -Always ensure water is hot and steaming and foods are at a minimum serving temperature of 140°F before putting food pan in place -Always use proper tool for removing lids. -Chafing fuels are NOT designed to cook; only maintain proper temperature for serving -Keep chafing fuels away from flammable table decorations or nearby items (i.e., curtains) -Always light fuels IN PLACE; use a long reach match or butane lighter; do not use other lighted cans or rolled up paper -Avoid touching GEL-TYPE cans as they become superheated overtime as the flame burns into the can -Always extinguish chafing fuel at the end of the event, using the proper tool -Dispose of spent fuel cans properly As always, click on the chat button for further questions regarding Choice brand chafing fuels. We hope this video helped you make the right “choice” for your foodservice application!! 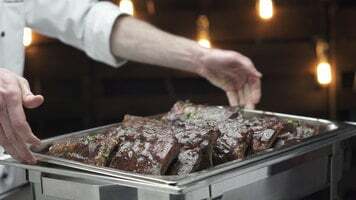 Serving hot food at a buffet, breakfast bar, or off-site venue requires efficient, reliable supplies. Choice offers a great line of chafers perfect for these and other applications, with economy, mid-range, and high-end options to choose from. 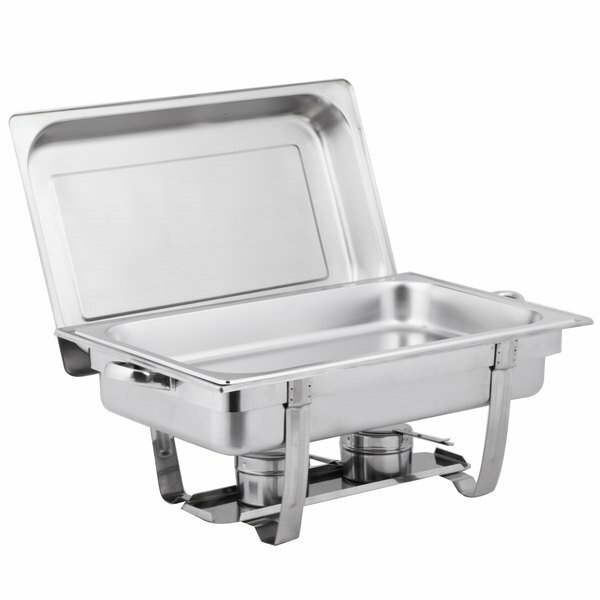 Choice Economy chafers are made of stainless steel and come with a frame, pan, and lift-off lid. 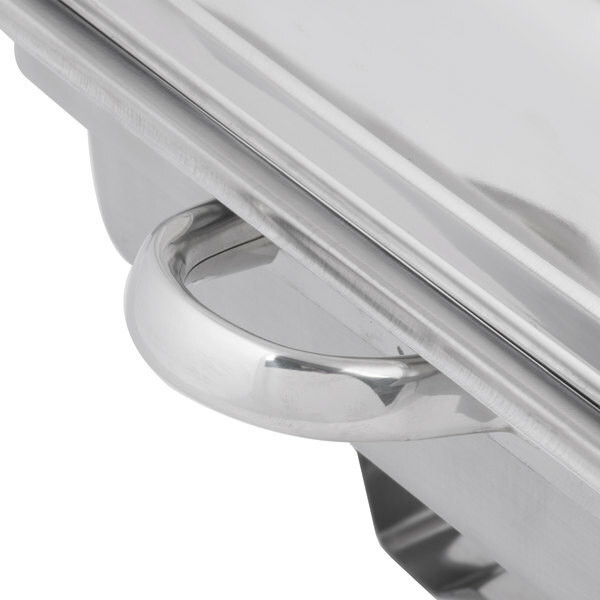 Plus, each frame features built-in side handles, which make transporting the chafer easy. 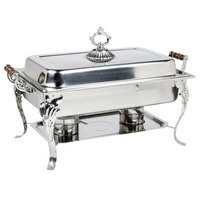 For a more stylized buffet, Choice Classic chafers are the perfect option! Each dish is made of 18/8 stainless steel with a mirror finish, making the Classic series both durable and great for formal events and venues. These mid-range chafers are designed with elegant features, from ornate lid handles to beveled legs. 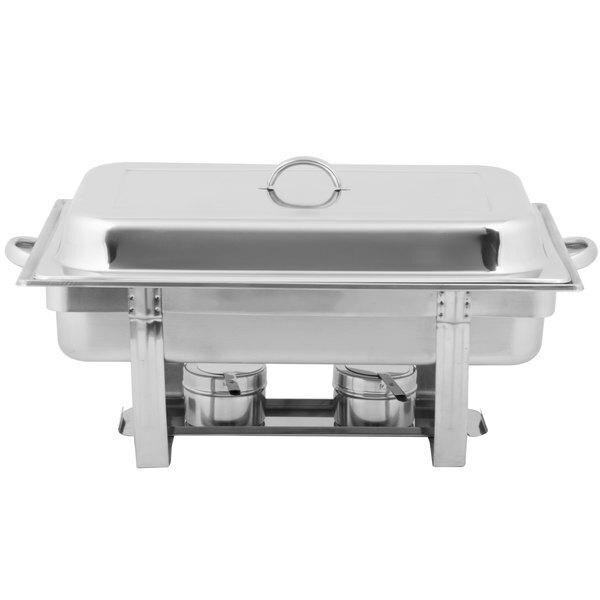 Each chafer also includes a lift-off lid, frame, food pan, and water pan. 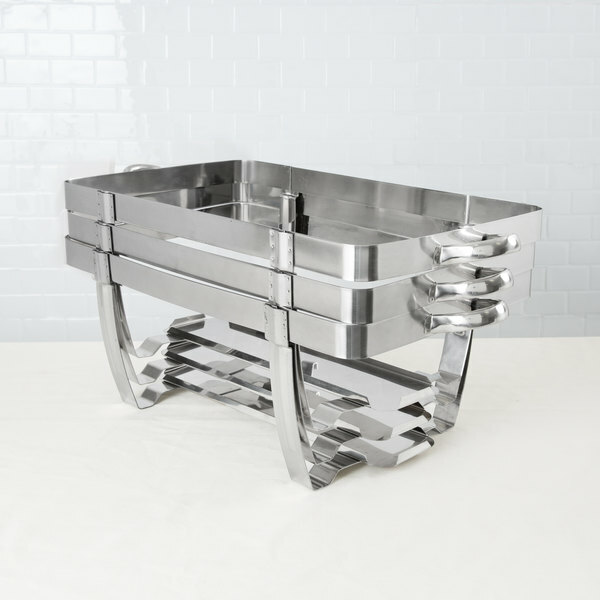 Choice Deluxe and Choice Supreme chafers are other mid-range lines that deliver a different aesthetic. They’re made of stainless steel with eye-catching, gold or chrome accents. These accents add a touch of elegance while keeping the design sleek with straight lines and rounded edges. 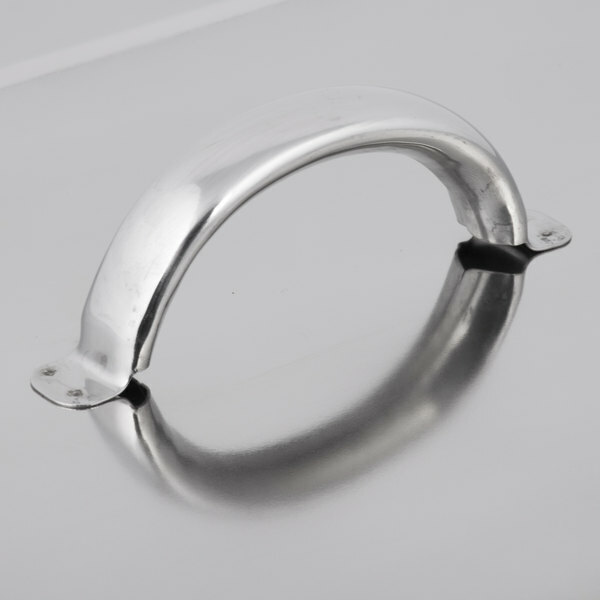 The stainless steel construction features a mirrored finish, and the round, oval, and rectangular shapes ensure versatility for any business. 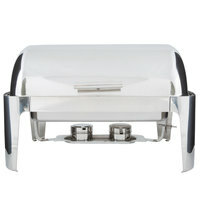 As an added benefit, most chafers include a roll-top lid. The Choice Deluxe line even offers soup chafers, with lift-off lids, and are designed to accommodate sauces, soups, and glazes. 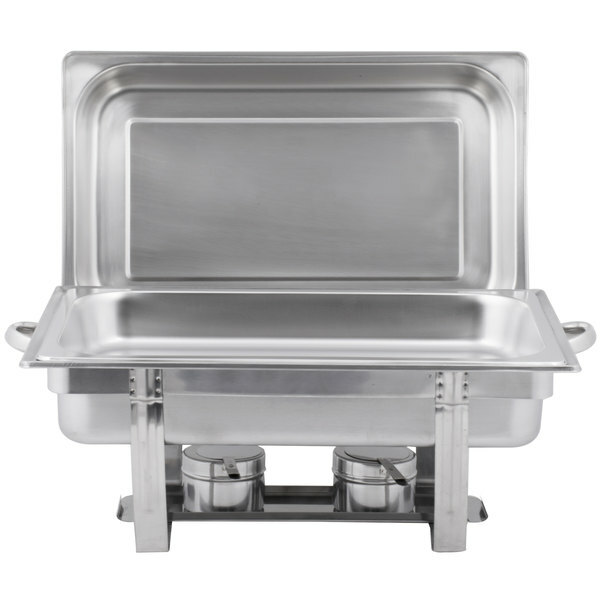 Like Choice Economy and Choice Classic chafers, food pans, and water pans come standard. For high-end applications, Choice Supreme offers induction chafers that boast glass tops and soft-close lids; these are perfect for use with portable or drop-in induction ranges. Standard Choice Supreme chafers are even available with a pine wood stand and built-in fuel drawer. 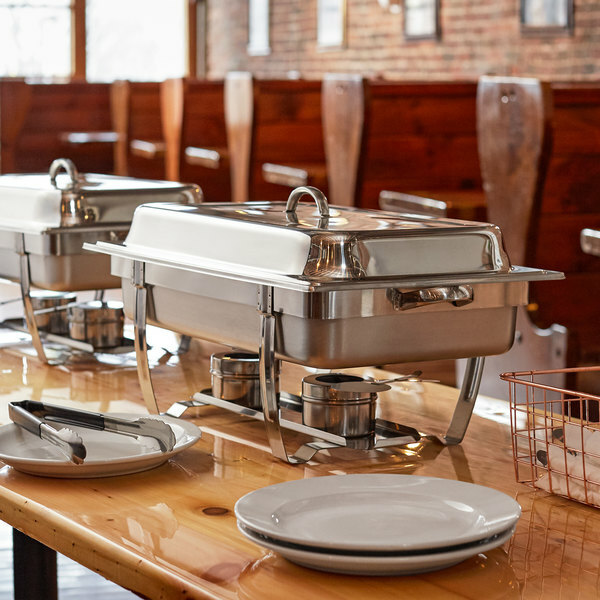 Whatever your needs and whatever your menu, Choice provides chafing dishes to help you serve with confidence and style! Get the most out of your chafers with Choice chafer accessories. 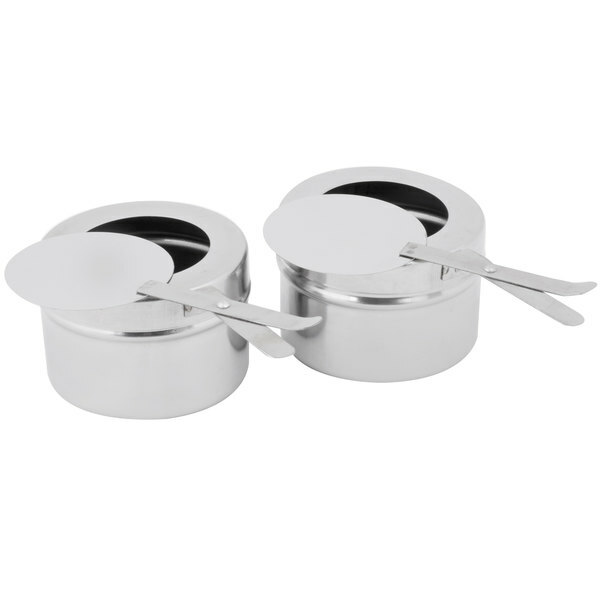 Stainless steel food pans are a great way to serve and display all of your delicious foods. 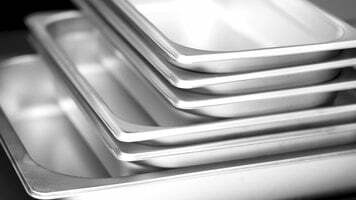 Coming in a variety of sizes ranging from full size to 1/3 size, you can use any of these pans at your buffet or steam table. You can fit two ½ size or three 1/3 size pans in your Choice chafers to offer even more options. Choice also offers different kinds of chafer fuel. These canisters have either a 2, 4, or 6 hour burn time, and many are environmentally friendly. The gel fuel is great for low-profile chafers, and the wick fuel offers safer use in high-traffic areas. 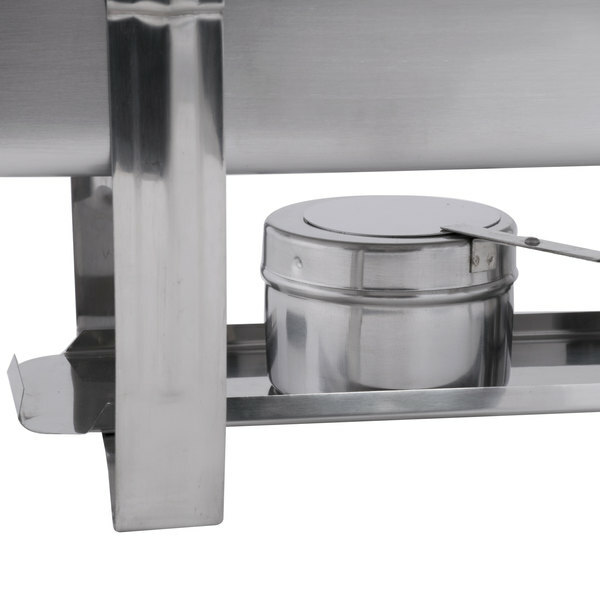 Use Choice chafer accessories to effortlessly complete your stylish chafer displays. Love these Chafers! They look great are very durable and do really stack. We have a set of 6 and that we use regularly for events. Do NOT order these chafers for a restaurant. Maybe for home use....they are NOT durable at ALL as stated in the description. Just a heads up. The company was very good about me returning them. Thank you for your review Steven! We are sorry these chafers did not work out for your restaurant. These are economy chafers, offered at an exceptional value. We recommend checking out our Mid-Range or our High End chafers for options that might better meet your standards. These stackable chafers are the best. Price is great and they look great. A wonderful addition to our inventory. Should rent well many times over. We have been using these chafing dishes for over a year now. They are still in great condition and are a favorite of ours as they have a stainless handle on the lid that makes them just a little different! loved the appearance of my new chafer. Looks durable and has a stunning shine. 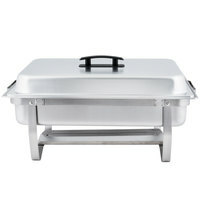 can't wait to have my next get together to use my chafer. So far have use these for about 20+ caterings and they have held up great! As our catering department grows we will definitely be purchasing more of these. Easy to clean too! 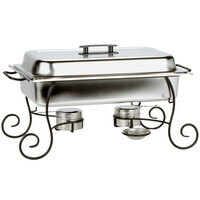 These chafing dishes are perfect for my parties. I love how they are stackable for easy storage. It is a great price for a great product! The chafers were a wonderful selection. They more than adequately fulfilled our needs. Purchased eight earlier in the year and after having a phenomenal response to their appearance and utility we ordered eight additional. We are more than happy. Moreover, we had one item that needed to be returned. The customer service at WebstaurantStore is far more superior than any other customer service I have dealt with. I would highly recommend to many others. 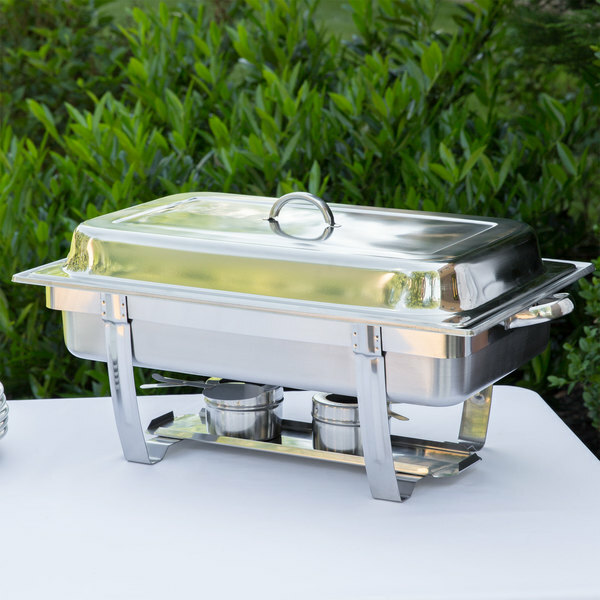 The choice eight quart full size stackable chafer dish is wonderfully made and a truly top notch serving chafer that is perfect for any size event. The chafers are stackable making them ideal for transportation and storage. I have seen similar items at various places. For the price this item is far superior than other ones I have seen offered. We use the chafing dishes weekly for one of our Specials nights. They hold up well, look like they are brand new. 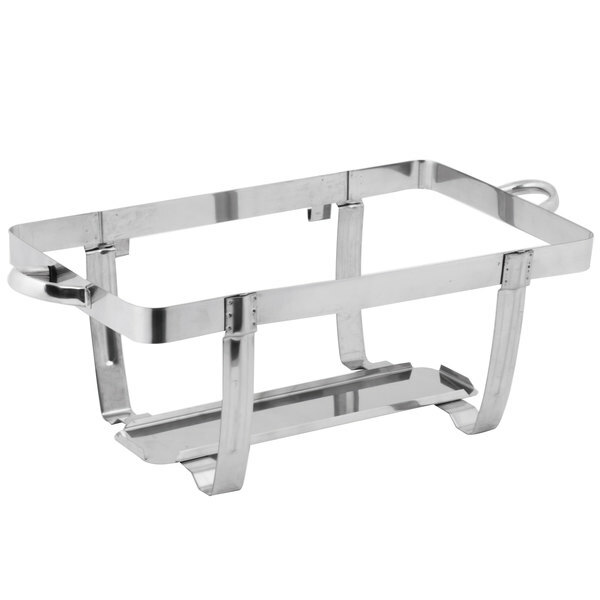 I purchased these chafing dishes to use for a shower I was hosting. The chafing dishes looked beautiful, and kept the food hot and moist. I filled one water pan with ice to keep the coleslaw cold, and it worked great. 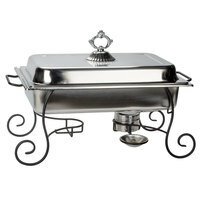 I got many compliments on how nice the chafing dishes looked. They cleaned up nicely, and I could stack all 3 to fit in one box for storage. I am very pleased with my purchase! They are fragile and some arrived bent. You have to treat them with alot of care because they could come apart. They looked really good lined up with food and economic. Ideal to keep food hot. I have owned these for about 5 years, and they still work wonderful. They still clean up and shine well. They seem to get the job done every time! I would recommnd these to any caterer just starting out. They are reasonably priced and they do last. The metal is so so thin. So cheap but I do not see these lasting long. I am almost embarrassed to put these out. Avoid these Chafers. We appreciate your review, Deborah. We wish this Choice 8 Qt. Full Size Stackable Chafer would have worked out for you. Our Customer Solutions team will remain in contact with you about this. This is a basic chafer, no more, no less. It does have hooks on one side to hold the lid while serving, which is nice. Great Value for the money. They are light and durable and clean up well. Also they are easy to shine up so that you can give that special touch to all of you events.